In honour of the mall’s 30th anniversary celebrations, Woodgrove Centre in Nanaimo is ensuring that it’s a “Scrooge-free” Christmas with free Santa photos this year! From now until 3:00 p.m. on Christmas Eve, visitors to Saint Nick in the mall’s Christmas Wonderland will be sent home with a free 5″ x 7″ photo. Packages from Freeze Frame Photography will also be available for purchase. Santa Claus will be visiting Woodgrove Centre from 11:00 a.m. until 8:00 p.m. Monday through Saturday and from 11:00 a.m. until 5:00 p.m. on Sundays. For more information this event, please visit Woodgrove Centre online. Woodgrove Centre is located at 6631 Island Highway North in Nanaimo. Awwww! Where can I find Santa in Vancouver? This post just reminded me that Allan and I should go do photos together…. or is that cheesy? Hehe! 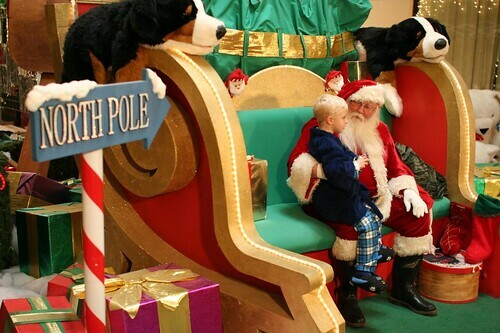 Awe this is great news I knw my children are looking forward to seeing Santa another yr! This yr went by so quickly I can’t believe 30yrs later wow that’s great news bout getting a free pic with Santa to there’s an family’s that just can’t offord pics so this is great news!! ⛄️☃️ Merry Christmas Happy New Yr Santa Clawa and Mrs Claws to and Great work to all ur hard working elfs Get lots of rest after all those great toys you’ve made all yr long!! !